The Congaree National Park is an old growth floodplain Southern hardwood forest. Situated on a floodplain, it represents a traditional swamp with distinctive trees including Bald Cypress. The Bald Cypress trees adapt to the inundation of water by having roots which surface above to ground level to convey oxygen to the tree's root system in an easier manner. The adaptation is known as "cypress knees" and the photo shows numerous knees for several trees. 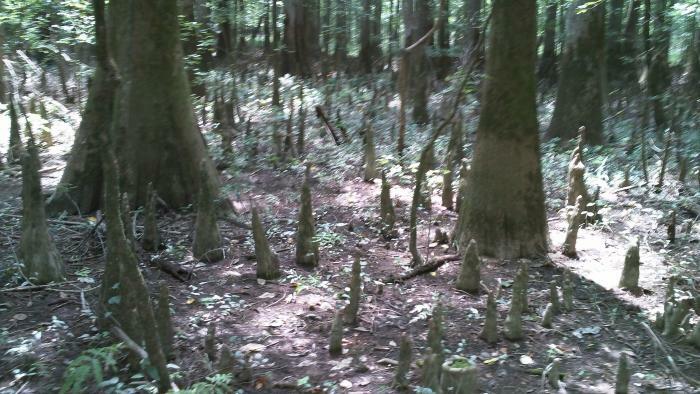 Since it had not recently rained all the ground around these Bald Cypress trees was dry and the knees are well exposed. Bald Cypress trees in a slough still had muddy water surrounding them, so the Cypress knees were not as readily apparent but may appear if the region continues to have dry conditions. 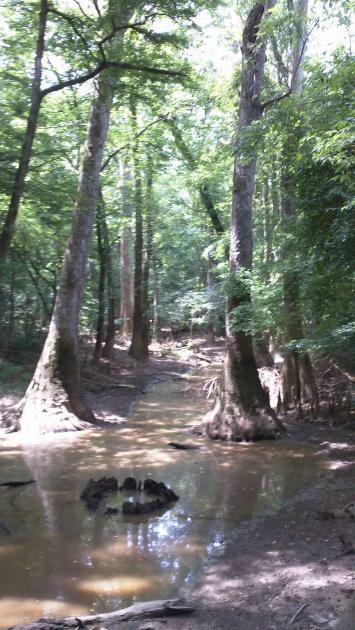 On the right hand bank, some Cypress knees are present in the photo, below.